Not to take away anything from Michael Phelps and his amazing 8 gold medals won with 7 world records and the other just an Olympic record, which took an amazing feat both physically and mentally, the latter of which is not benefited by any known drug enhancement, but swimming medals are cheap. It seems a little silly to have medals awarded for FOUR different ways of swimming the same length, then add relays on top of that, along with races of different lengths. 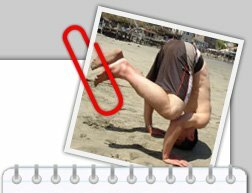 It's not like for the 100m dash, there's one where you run normally, one where you run backwards, another where you run sideways, do cartwheels, crawl, crabwalk, or run on your hands. It's silly. It's 100m and you get from point A to point B as fast as possible, regardless of technique. It's not like when people found out that doing the "flop" was more effective than the "scissor kick" in high jump that they branched out to make a new event where you had to do the flop or had to do the scissor kick, you just get over the bar any way that you want and who ever jumps the highest, wins. Simple. You could argue that the different swimming styles require different specialization, but apparently not enough if one guy can get the world record in 8 events and don't give me the argument that it's just because Michael Phelps is amazing (which he is), but Mark Spitz won 7 gold medals in swimming in a single Olympics in 1972, so this is not a unique case (there must also be other athletes that compete in multiple swimming events). Despite the different styles being rather different, it's been proven that it's possible for someone to win in multiple of them, which seems to indicate that they are not that specialized and perhaps that the events are too similar. The backstroke seems different enough still, as it's something that Michael Phelps doesn't do. Sure, the 100m, 200m, 4x100m, and 4x200m track events are similar in that you can win multiple events with basically the same training, but if you were to keep going to longer events, it would work entirely different parts of your body (aerobic vs anaerobic). Then there's diving where you can basically do the same thing on higher and higher platforms to win multiple medals. Rowing, badminton, equestrian, table tennis, and tennis, could all score you multiple medals if you compete in various combinations of individual and team events. Still, these all seem to pale in comparison to swimming in terms of medal opportunities. Even just the chance to have more than one Olympic gold medal in a single game seems unfair, because there are many sports where it is impossible to get multiple medals, no matter how good you are and how much you train. Volleyball comes to mind for obvious reasons. No matter how good you are, you can only get one medal. Because of scheduling reasons, it would be impossible to compete in both indoor and beach in the same games, not to mention the grueling schedule and the amount of training that is required to form a proper team. Then there are the sports where no matter how good you are, you can't even transfer those skills to another event even in a different Olympic games. If you were the best batter in the world, the only sport that you'd be able to compete in would be baseball (sorry, no cricket in the Olympics). It wouldn't matter if you were Zoro, you could only ever compete in fencing and win that one medal each Olympics. The discus throw doesn't really translate to being able to compete in any other events. Michael Phelps must train extremely hard and must be entirely dedicated to swimming, but seriously, 8 medals for him, while an entire volleyball team with a roster of probably 12 or more playing in several preliminary matches followed by playoffs yields you only one single medal? Yet, in the end for the rankings, all medals are worth the same regardless of the event, individual, or team. The amount of effort, talent, performance, ability, and training required for each medal is vastly disproportionate and that to me, is unfair. I still love watching the Olympics though! 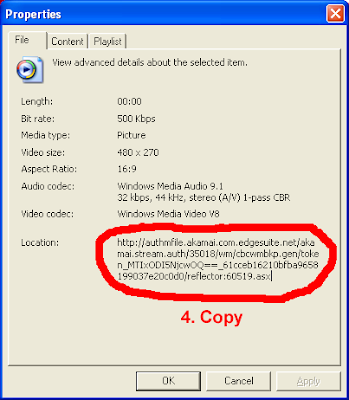 This tutorial will show you how to record the Olympic games from an internet streaming source using VLC. 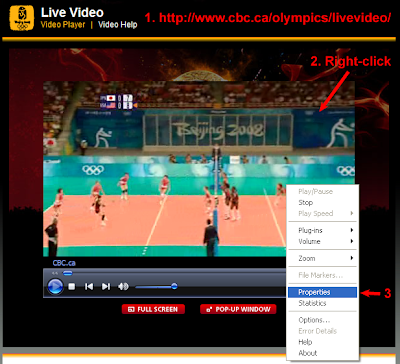 Since I am in Canada, I'm recording from CBC Olympics, which streams the videos in Windows Media format, but this procedure should work for other non-flash, non-silverlight, streaming videos as well (i.e. not YouTube or NBC Olympics). The URL in between the quotation marks is the actual URL to the streaming video. 8. 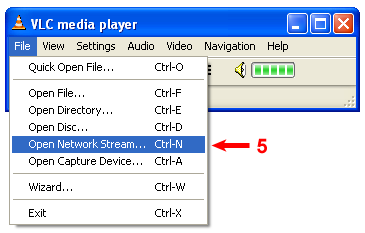 Select "Stream/Save" in the "Advanced Options"
10. Select "Play locally" and "File"
11. Specify the save file, eg. 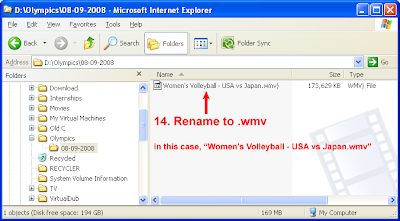 "Women's Volleyball - USA vs Japan.wmv"